My next Andrew Miller book is his second, ‘Casanova’ (or ‘Casanova in Love’ in some countries). It is a novel about Casanova’s time in London, particularly his romance of Marie Charpillon. It was not a successful romance and Casanova was not the same since. I’ve read some Casanova, though I’ve not reached his adventures in London, but the Casanova in this book is really not the same person as the one he writes about. Casanova’s ‘History of my Life’ was written when he was an old man, with far more experience and far more misadventures then those times in middle age when he was in London. 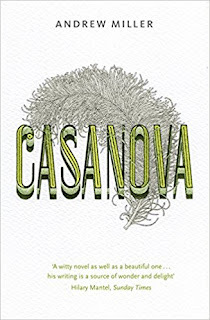 Despite this extra experience, Casanova seems to view his younger self with such affection and amusement that the world-weary, tired-of-life element of this book doesn’t really ring true. It’s also not much fun. Casanova is so dour in this. Viewing London in the eighteenth century as little more then a purgatory in which he is condemned to live out the whole of his life following the same dull patterns. Actually, it’s more like Tartarus, where Tantalus finds all his pleasures pulling away from him at the last minute. Throughout the course of the book, Casanova tries to seduce Miss Charpillon, but she plays him repeatedly, driving Casanova half-mad. In public she fusses over him, leading everyone around to feel that she and he are together, but when he gets her alone, she closes up physically and emotionally - which he can’t cope with at all. He starts to question how easy and enjoyable such intrigues used to be and questions the paths he has taken that has led him to where he is now. In reality, Casanova did act in extreme ways; threatening her with a fruit knife, buying lead shot to drown himself in the Thames and training a parrot to describe her as a whore. It is extreme, but Casanova (in one of his less famous romances) stole locks of a woman’s hair and turned them into special sweets. Casanova dug up a corpse as a prank against someone who got his coat dirty. He always let his feelings and actions to go too far, this romance seems business as usual as far as Casanova is concerned. In the novel, he does threaten her, he does buy the lead shot and he does train the parrot - to say ‘je t’aime’, watering down Casanova’s fantastic bitchiness. 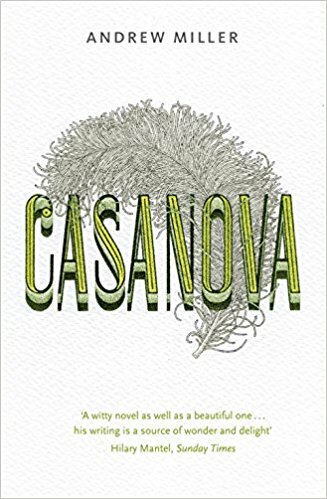 Other things added to the novel include a completely confusing section (which begins without warning) where Casanova and his manservant swap clothes with poor people and live as penniless builders for a few weeks. Why they do this is never explained, it makes no sense from Casanova’s point of view and has no real point. I have the feeling that it is trying to make a point about something, but I’m not sure what. A relationship is created between Casanova and Samuel Johnson. It’s a great idea; one represents Venetian impulsiveness, lasciviousness and luxury and the other represents English common sense, plain wholesomeness and solidity. However, Johnson is flat - as is Casanova. 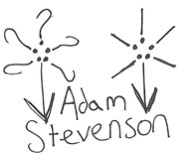 In this pair, we have two of the finest raconteurs and conversationalists in history, but the dialogue is plain. Though I did like Johnson as a secret lech. Something that did work, was the inflation of a massive storm that grows to a Biblical flood, engulfing London up to the roofs, causing people to row around it, tying their boats to the steeples of churches. It’s a lovely image, with Casanova finally able to feel home after years of exile. It is, however, a very fairytale image which doesn’t really sit well with what is often a grounded and somber book, which again feel like it’s making a point I don’t quite understand. It’s written by Andrew Miller, and so very well written. I particularly enjoyed the description of the ticking of a clock being the sound of time’s hammers chipping away slowly at an hour and also the description of a young woman’s lips looking as succulent as new prawns. He has a wonderful way of putting things and I don’t think I could ever not enjoy one of his books - but this one was very difficult to find out what he was actually trying to say. I just didn’t get it.